"Expressions. Sample cartoons ". Individual sample. Location: Upstairs Northern District Municipal Center "Villa Hortensia". Rosario. 2007 - Participation in the collective exhibition "101 Great Caricaturists and portraitits of the World" exhibition of cartoons and comic Romanian playwright Ion Luca Caragiale, organized by the Romanian Cultural Institute. Madrid, Spain. "Exaggerations. 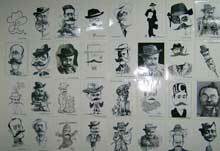 Sample cartoons ". Individual sample. Location: Ground floor of the Municipal Center Northern District "Villa Hortensia". Rosario. Sticky". Individual sample. Location: Credicoop Bank. Rosario. "Celebrity Caricature." Individual sample. Exhibition hall of the Public Library "stimulus to study." Rosario. "Looks different". 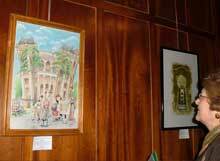 Group exhibition of 10 years of the Northern District Municipal Center "Villa Hortensia". 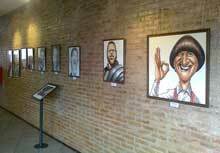 Exhibit: "Drawing to Villa Hortensia". Location: Northern District Municipal Center "Villa Hortensia". Rosario. Participation in the seventh and ninth edition of "Euro-American Art" book that collects artwork from over 70 artists, as the name of the book, America and Europe, edited by ADAPI, International Association of Artists. Participation in the convention "Illustrators", organized by the ADL, the Coastal Association of Illustrators. Location: Center City District "Rosa Ziperovich". Rosario. Participation in the catalog of caricatures of Romanian writers Eugene Ionescu and Emil Cioran, edited by Romania Cartoonists Association. Obtaining a recognition of excellence in such activities. "Exaggerations. Sample cartoons ". Individual sample. 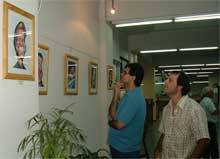 Venue: Exhibition Centre District Municipal Center "Antonio Berni". Rosario. "Exaggerations. Sample cartoons ". Individual sample Solo exhibition. 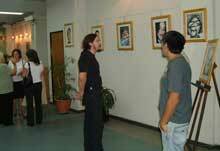 Location: Central Hall of the "Ministry of Culture and Education of the City of Rosario". Rosario. "Exaggerations. Sample cartoons ". Individual sample. Location: Exhibition Hall of the Public Library "Stimulus to study." Rosario.